A video game in which the character is controlled directly from a player's brain without the need for wires has been developed by researchers. Mind Balance was demonstrated for the first time using a new wireless headset, at the MIT Media Lab Europe in Dublin last month. The game could help researchers develop brain-computer interfaces for those with limited body movement. But, said the team, it could find its way into future video games. "It is absolutely a possibility," Ed Lalor, research associate at the labs, told BBC News Online. "If we can make this new wireless device that we have developed, the Cerebus, more aesthetically pleasing, a little bit smaller, that would make the device actually easier to put on and use." The idea of controlling electronic devices via plugs or implants in the brain has been a recurring theme in science fiction works, like William Gibson's novel Neuromancer and the Matrix films. 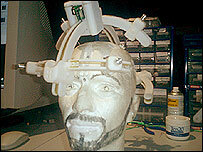 Research laboratories around the world have been working on technologies which let people "jack in" to computers directly from their brains, including Cyberkinetics, whose BrainGate system is currently undergoing trials. But the Mind Balance game demonstration showed how brain activity could be harnessed and used without the need for plugs, jacks or wires. Instead of wires, it uses direct electroencephalography (EEG), cerebral data nodes and the wireless technology - Bluetooth - all fitted into the sophisticated Cerebus headset. With six different types of nodes positioned over the occipital lobes at the back of the head - responsible for processing light, vision and hallucinations - Mr Lalor, as the player, focused on to two chequered boxes which flashed at different frequencies. "Because they are flashing at different frequencies," he explained. "They evoke different responses in the visual cortex. "We are able to pick up electrical activity on the scalp and take the brain activity into a C# signal-processing engine which analyses those signal in real-time and makes a decision which of the two boxes the player is looking at." 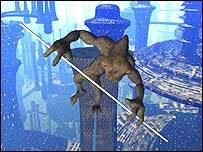 By "tuning" into the boxes on either side of a huge screen in turn, the frog-like virtual character, Mawg, was balanced and walked across a tight-rope. 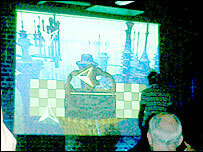 If he started to fall to the left, the player had to tune in to the box on the right of the screen to correct the balance. Developments like Microsoft's new object-oriented language C#, a variation of C++ but with Java-like functions, have made this signal-processing and translation easier. In computing terms, C# makes it easier to create, manage and access objects. Devices like the Cerebus are getting easier to use too which, according to Mr Lalor, means gamers could be attaching them to their own heads in a few years' time, in their own homes. The research has some serious applications though. 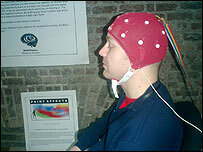 Much of the focus of direct brain-computer interfaces has been on developing the technology for people who have limited body movement, and the Mind Games research is no different. The next hot thing for gamers? "This game was our first stab at creating a brain-computer interface controlled environment," explained Mr Lalor. "One of the obvious applications is for someone who is locked in or paralysed completely, somebody who has an advanced case of ALS [Amyotrophic Lateral Sclerosis], where they literally cannot communicate at all, but their brain is operating fine. They can still see and hear but can't move or speak. "If we had a direct link from their brain to their computer, they could communicate." Mr Lalor and the rest of the team are keeping up with the plethora of research being done around the world on brain activity and hope to move the work on quickly. "With the software tools that we have, we can develop stuff a lot quicker than most places. "So as soon as we have a good idea for a nice communications interface to be used with our new brain device, we will have a communications tool for somebody who would otherwise not be able to communicate at all."